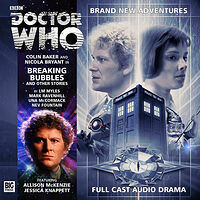 During the good Doctor's long absence from our television screens during the late 1990s, a monthly series of BBC-approved "new audio adventures" began, produced by British company Big Finish. This series of CDs are all professionally-produced audio dramas with full cast, incidental music, sound effects, etc. They star either the Fifth, Sixth, Seventh or Eighth Doctors, along with familiar companions (all played by the original television actors) along with occasional special guests. In short, they were as close to "proper" Doctor Who as you could get until the new television series came along! Even with the success of the new TV series, Big Finish's licence has been renewed to the end of 2020, so the New Audio Adventures range should continue for the foreseeable future.